As far as free file hosting services go, Megaupload trumps Rapidshare by letting users download files with more generous download limits (around 250 MB in any given time frame) before giving you the dreaded download limit exceeded error. 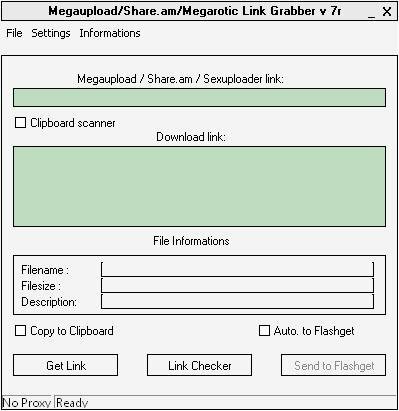 You can make the process even smoother by getting the Megaupload/Share.am/Megarotic Link Grabber. After opening it, simply paste in the URL of a file hosted by any of the three services, and you'll get back the location of the file you want to download. You can either then use the link grabber to download it or even send the link to FlashGet with a click of a button. Similar tools you might want to look at work with services like Rapidshare and MediaFire.